Perform an inspection of all Swinging Fire Doors per NFPA 80 standards. Create a physical ad digital database for all Swinging Fire Doors that can be used for future annual NFPA 80 Fire Door Inspections. Create real solutions for bringing Fire Doors back in to compliance with their rating and provide recommendations when needed. 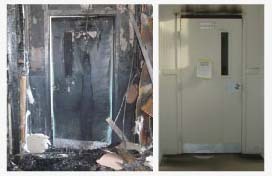 Replace damaged or worn Fire Rated components of a *Swinging Fire Door Assembly. components may also include an astragal, an automatic louver, a coordinator, flush or surface bolts, gasketing, a holder/release device, protection plates, and glazing units. Inspections are priced at $40 per door plus travel costs. Follow-up Inspections are priced at $18 per door plus travel costs. Labor for repairs and replacements are priced per hour at $110 plus travel costs. Hardware and door/frame replacements require a quote to be sent and approved.